If you look in a typical infant classroom or home-based child care program, you will frequently see a variety of devices used to keep non-mobile or crawling infants off the floor. These include seats, swings, saucers, and more. Usually, the rationale for this is to keep a non-mobile or crawling infant from being trampled by walking infants, toddlers, and older children and/or to provide the infant with stimulation. Both of these rationales are sound, yet the result is that young infants are sometimes moved from ‘container’ to container leading to restricted opportunities for movement and development. Infants should have the opportunity for play in the least restrictive environment possible. This Freedom of Movement promotes the development of core muscles that are essential for the development of gross motor skills including rolling over, sitting, and crawling. Freedom of movement also provides the infant with the opportunity to explore their feet and hands allowing the infant to gain confidence with themselves, while they gain interest in exploring the world around them. Providing infants with environments that allow them to be in positions they can get in and out of on their own is integral to optimal developmental outcomes. New York’s Infant/Toddler Resource Networks have specific strategies and resources available to reduce the number of containers used in early care programs. The Capital District Child Care Council has developed a Freedom of Movement Certification based on the work of Dr. Emmi Pickler1,2..
Dr. Pickler was a groundbreaking Hungarian Pediatrician who researched gross motor development and pioneered a philosophy of treating babies with respect i.e. allowing them to develop at their own pace and telling babies what you are going to do before you do it. The Freedom of Movement Checklist contains rationale and strategies for each of the items on the tool. Child care programs can seek to reduce container use with infants or they can strive to obtain the Freedom of Movement Certification from the Capital District Child Care Council. Programs can conduct their own assessment using the checklist. They can also obtain technical assistance from an Infant/Toddler Specialist through their local Child Care Resource and Referral agency. To obtain the Freedom of Movement Certification a program would complete the checklist, submit it, and then an Infant/Toddler Specialist would visit the program to provide technical assistance and verify the checklist. 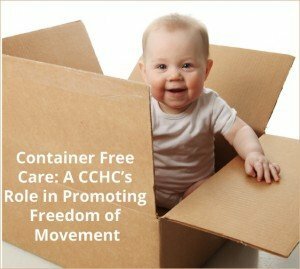 If more than one or two containers are present in an infant classroom or home-based program, Child Care Health Consultants should inquire if caregivers are familiar with the concept of Freedom of Movement. They can refer to the resources from the Capital District Child Care Council, the NYS Infant/Toddler Resource Network, as well as the ones found in Module 5 in the NYS CCHC Resources Video Series. 1.Pikler, Emmi (Winter 1994). Peaceful Babies Contented Mothers, Sensory Awareness Foundation Bulletin, 14, 12. 2.Pikler, Emmi (2006). Unfolding of Infants’ Natural Gross Motor Development. Los Angles: Resources for Infant Educaring. ← Sudden Infant Death Syndrome: What the Numbers Mean to Me.